When Xcel Energy needed to construct a 2.2 mile high pressure natural gas pipeline from Eagan to Burnsville, Minnesota, they contacted an experienced pipeline contractor, Snelson Companies, Inc. to get the job done. The purpose of this project, dubbed “Black Dog” is twofold. First, to stream a new source of natural gas between the Northern Natural Gas Company’s Cedar Station in Eagan to the Black Dog Generating Plant in Burnsville. Second, to renovate the aging coal-fired generators at Black Dog and convert them into energy efficient gas-fired generators. When Hank Sullivent, Superintendant at Snelson read over the full scope of this project, a light bulb went off. Why not reach out to the Burnsville community and let them know exactly what’s going on in their backyard? So he asked Kevin Culak Regional Safety Manager at Snelson and Jayson Honer, Lead Inspector for WBS & Associates to see if they would be interested in visiting Sioux Trail Elementary School in Burnsville, located just north of the pipeline construction route, and talk to students about the importance of pipelines and the safety issues that go with them. 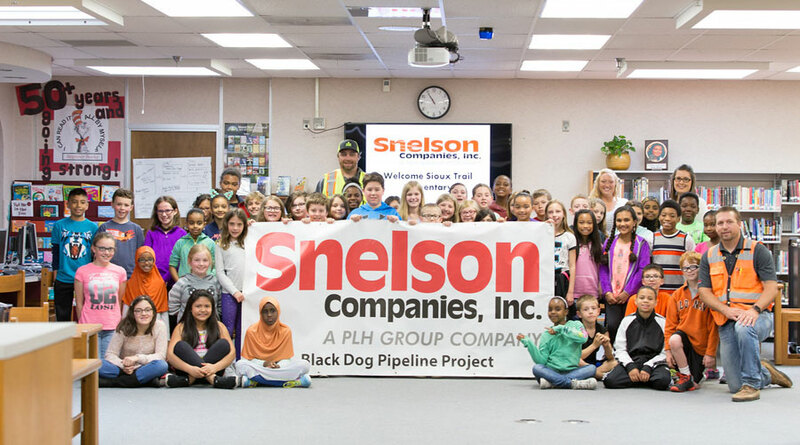 Everyone at Snelson was on board with this “field trip” to Sioux Trail, however, the teachers at the elementary school were a bit skeptical about how well a presentation on pipelines would be received. As it turned out everyone learned a lot about pipelines and natural gas that day, including the teachers. Kevin did a wonderful job preparing age appropriate presentations for the 350 Pre-K to 5th Grade students. 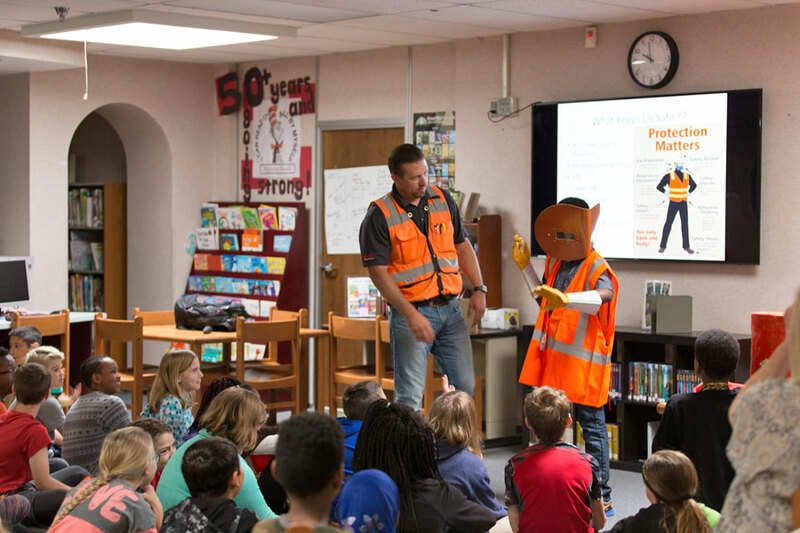 The students were all eyes and ears listening to Kevin as he demonstrated the importance of safety gear while working on pipeline construction. 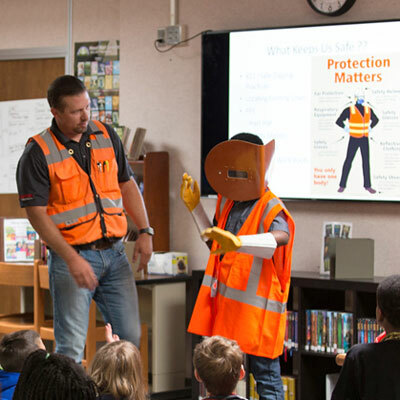 The photo below shows a student wearing safety gloves, a reflective vest, and a welder’s mask. In the background a slide titled “What Keeps Us Safe” gives pointers about safe digging practices and the gear that’s needed for protection on the job. The presentations not only covered the facts about pipelines, it also covered safety issues such as what to do if you smell a rotten egg in your home. The answer? Don’t touch anything in the house, gather everyone together and go outside, or to a neighbor’s house and call 911 immediately, as natural gas (which smells like rotten eggs) could be leaking. The students were also excited to receive tokens from the presenters, such as a black draw string backpack printed with the Snelson/PLH logo filled with a Snelson safety sticker, pencils, pens, and small pocket note books provided by subcontractors, WBS & Associates and Braun Intertec. These items will be great reminders of what the students learned that day. The true takeaway here is, education is power, and knowing where our energy comes from and how to react in a natural gas emergency is invaluable.